Good Morning America producer Mike Del Moro was walking the Seaside Heights, New Jersey, boardwalk with his boyfriend, mom, and sister after celebrating Mother’s Day when he saw it start. As high school prom goers strolled by in their finest dresses and tuxedos, a group of rowdy “bros” started yelling at them from a rooftop bar. The guys were “obnoxiously yelling ‘KISS HER!’ in unison at every apparent couple that passed by,” Del Moro recounted on Twitter. But when a young gay couple walked by in matching tuxedos and holding hands, Del Moro and his family went on high alert. After all, New Jersey bros aren’t known for their diversity of thought and gentle nature. Still, they weren’t expecting what happened next. But when the two teens nervously smooched for the audience, the crowd. went. wild. This is not a “look everything’s fine now, thread,” and yes… it’s New Jersey, but I just thought it was worth sharing and an encouraging moment for young LGBTQ folks out there. But then… because this story just keeps getting better… Twitter found the two teens he was talking about after someone recognized one of the teens as a former classmate. 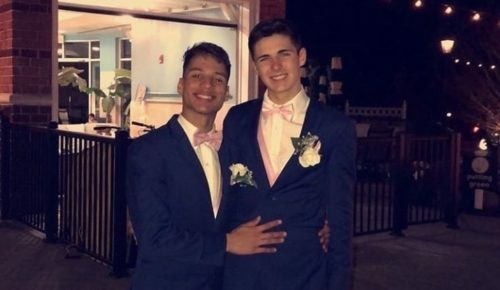 Theodore Vidal and his boyfriend, Colin Beyers, were walking back from prom together when they brought their own brand of magic to the boardwalk. Buzzfeed caught up with the two to get their backstory and it’s just as adorable as they are. When Vidal came out as a freshman, he says he was regularly ridiculed and bullied in school. To help cope, he turned to music – and that’s how he met Beyers. The two played together in a symphony and after “making eyes at each other” for months, the two boys finally realized they had something special. Beyer came out shortly after the two started dating and his experience was remarkably different. Still, he knows not everyone has the same reaction from family and friends. One thing that looks good on everyone? Love. And those two are beautiful.